The militant Muslim is the person who beheads the infidel, while the moderate Muslim holds the feet of the victim. All Presidents are concerned about their legacies. Having essentially reach both the pinnacle and end of public meaningfulness, the tend to worry about how history will remember them. In this it is logical to conclude that Obama is more concerned with this than most of predecessors. Of course, Obama is also in the lamentable position of having his legacy tied tightly with that of his immediate predecessor, President George W. Bush Jr.. 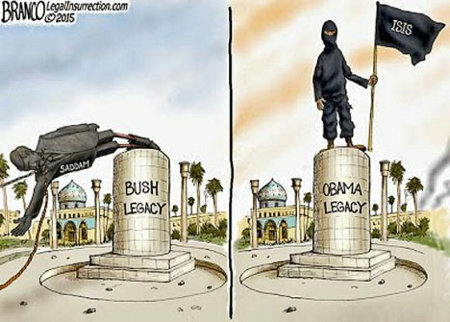 This will cause the boy’s legacy to be compared to Bush’s. This entry was posted on Saturday, May 23rd, 2015 at 10:11 am and is filed under Humor, Politics. You can leave a response, or trackback from your own site.